Today I am so happy to welcome Orli Zuravicky to the podcast. She is a senior editor at Scholastic and the author of several books including the recently published middle grade series Happily Ever Afterlife. Your new middle grade series Happily Ever Afterlife was released last year and now has two new books coming out this fall. For those listening who aren’t familiar with the series, can you tell us a bit about it? One of the reasons that I love paranormal stories is that phase of figuring out the rules of the world the story is set in. For example, there is no interaction between the ghost world and the previous world, once someone becomes a ghost, they stay that age forever…. How did you decide on the parameters of the afterlife in this book? With a book that is essentially about a middle school girl dying, it could have gone very dark. But it’s an upbeat and fun read. How did you strike that balance to avoid having the story be too morbid? 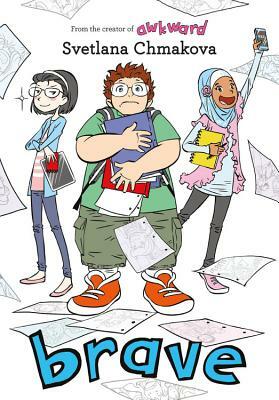 What is next for Lucy and the others students at Limbo Central Middle School? So you work at Scholastic! You previously wrote a couple of board books..
What made you decide to try a paranormal middle grade? Right now my 5th graders have been working on writing narratives – personal narratives and stories. What is one piece of advice you would give them about how to make their stories come alive? In this section of the show, I share with you three books centered around a theme and discuss three things to love about each book. This week I am featuring three books about the power and perils of friendship. They are Beatrice Zinker, Upside Down Thinker by Shelley Johannes, Brave by Svetlana Chmakova, and Real Friends by Shannon Hale. The illustrations! I just love the movement and the shapes and the orange tints throughout. There’s long-legged Beatrice suspending from trees, her strict triangular teacher, Mrs. Tamarack and cute wide-stanced Lenny. There are pictures on just about every page! Beatrice’s attitude! When we first learn of her super secret spying mission, it’s not entirely clear what her plans are. But, the way that plays out and how that ties in with the situation with the new girl, Chloe… I don’t want to say too much and spoil it for you, but…I love it! And I think you and your students will, too. This book about an upside down zany girl who has a knack for seeing the upside in everything would be a great read aloud and perfect for kids in about grades 2-5. The diversity of characters! Throughout the pages there is a huge range of skin tones and hairstyles. One of the trio of friends who run the school newspaper, Akilah, wears a hijab. She is absolutely my favorite character aside from Jensen. (And I really hope she gets her own book someday!) She’s bold and wants to be a voice for justice. And she also handles her friend and vlog co-host, Jenny, very well. Jenny can be, umm… a little intense. I also love the diversity of body types all throughout. Our main guy, Jensen, is overweight and some of the bullies call him cruel names because of that. Or rather – I should say – because they’re jerks and the insults just reference that. And I love how the story is not about Jensen wanting to lose weight to attempt to fit in. And characters that you think are going to fill a stereotype surprise you! Like Jorge – Jensen’s partner in English class who at first glance, seems like a big jock who just wants to do a project on baseball. But the sports part is actually not what he wants to focus on! The depth in the minor characters in this book are really remarkable. How this book really sheds light on the fact that friends can be some of the biggest harassers! And I think the author does a deft job of helping readers reflect on bullying through the survey Jensen takes as part of the social studies project Jenny is working on called The Lizard Brain Culture in Middle School. In a very accessible way, it brings forth ideas like normalized behavior and in our society where cultural norms and gender norms and political norms are changing quickly, I think the reflecting that happens in this book is a good thing. The small thread in this book about the dress code. At one point, Felicity gets suspended for wearing a skirt deemed too short. So, the school is in an uproar and they put together a petition to get her back. Personally, I loved that several of the teachers were just as upset and used the opportunity to have their class discuss it and discuss the long history of controlling what women wear. Brave warms your heart, makes you laugh, and gets you thinking about what you want to see in the world. The call-backs to the first book, Awkward, are fun if you’ve read it, but kids absolutely don’t have to have read Awkward at all to enjoy this book. If you have a child who loves to draw or one who has trouble finding that group to fit into or a child who has been a target of bullies, Brave would be a perfect story to share with them. And – I just saw the other day that the third book will be out next fall. It features Jorge and is called Crush. Can’t wait for that one! How Shannon Hale understands those seemingly small but socially HUGE details that happen in the lives of friends. 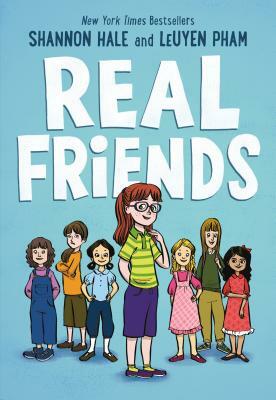 Such as who sits next to who at lunch, who gets invited to whose house, the intentional but unseen by teachers jabs in gym class, the ranking, and the lying… ugh… After Shannon’s first Kindergarten friend Adrienne moves and then comes back, she gets attached to what’s called The Group – these popular girls lead by Jen and her friend Jennifer. Adrienne is clearly IN, but Shannon is sometimes OUT. How this book is not just about Shannon learning how to make good friends, but also about her learning how to BE a good friend. Early on after her first real friend Adrienne, moves away, she makes friends with Tammy. A girl that I think is in foster care and there’s hints about how challenging her life is. Tammy joins Shannon’s class and they become friends but Tammy is FAR more attached to Shannon while Shannon is still pining for Adrienne and is cold to her and makes her feel bad when they say good-bye for that last time. I appreciated that this book was honest with her own mistakes. And when I was finished reading, I wondered a lot about Tammy. The Wendy section. The final chapter is about Shannon’s older sister Wendy who can be amazing but who also has this incredible mean streak – hitting and scaring and forced tickling. Shannon feels like there’s this wild bear unleashed in their home that no one else sees. And that doesn’t exactly change but evolves in a way that I think a lot of children can relate to who have complicated relationships with their siblings. That piece of the story reminded me a lot of Swing It, Sunny so if you have fans of that book, this would be another great title to have them check out. 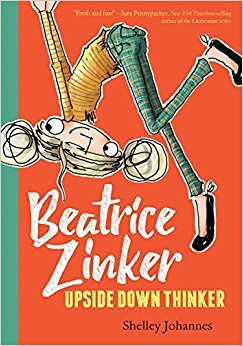 So if you are looking for some great new books to introduce to your readers that have the universal and timeless theme of friendship absolutely check out Beatrice Zinker, Upside Down Thinker, Brave, and Real Friends. Alright – that wraps up our show this week. We have some great interviews and book talks coming up this fall on topics like the Anne of Green Gables graphic novel and the timeless appeal of The Baby-Sitters Club. And our Q&A section will be back next episode! Thank you so much for joining me this week. You can find an outline of interviews, and a transcript of all the other parts of this show along with all of our previous episodes at AlltheWonders.com. And, if you like the show, please help others find us too by telling a friend, sharing on social media, or leaving a rating on iTunes or Stitcher.